This summer has been the summer of movies (because it has been rainy and/or cloudy 99% of the time in Indiana) so naturally I’m consuming a little a lot of movie theatre popcorn. 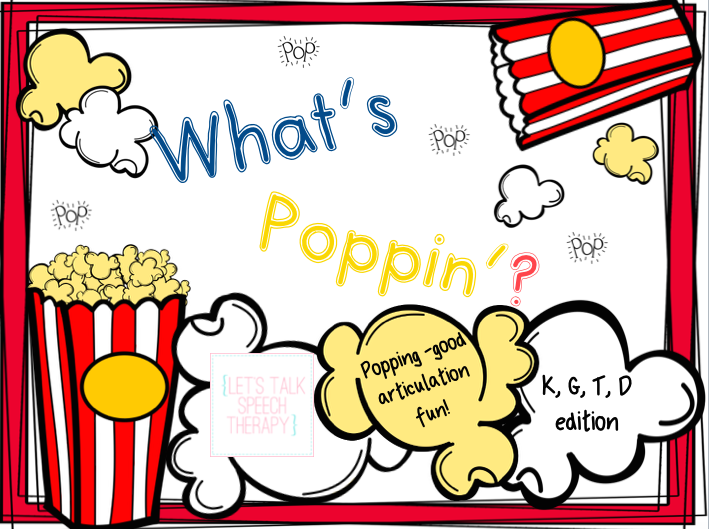 This is the first of the “What’s Poppin’?” series, so naturally k, g, t, and d sounds are leading the way. Each sound has 30 target words: 10 initial, 10 medial, 10 final position. Your kiddos can use popcorn containers found in most dollar stores/dollar spots (I found mine at Target), a bowl, or any kind of container! After correct production, the child keeps the popcorn card. 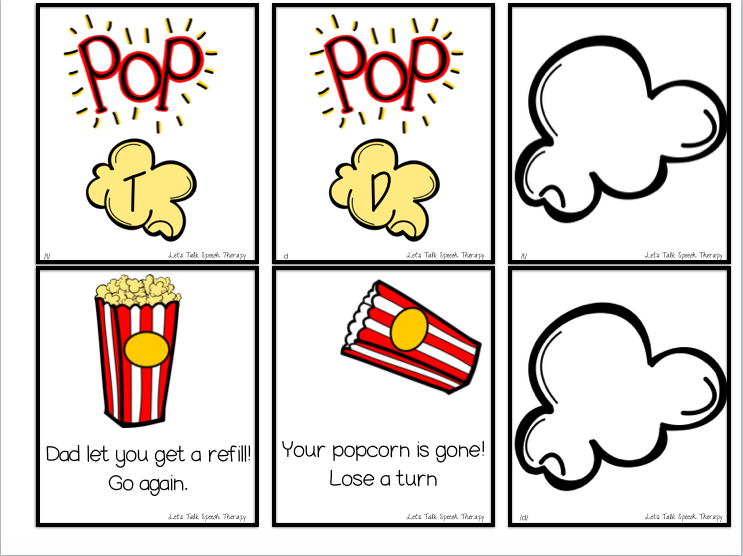 The player with the most popcorn kernels at the end is the winner! Foil cards, deck covers, and one blank popcorn piece for customization is added for each sound. The packet also include 16 sound sheets–initial, medial, final and mixed sheets for each sound. These are great for quick homework sheets, roll and cover activities, dot markers, you name it! You can grab this download here in my TPT store for some poppin’ articulation fun! Be sure to keep an eye out for more sounds coming soon. The “I didn’t go!” blog hop! You’ve made it! If you’re reading this post, you’re at the very end of the “I didn’t go!” blog hop–a little bit of fun for those of us SLPs who didn’t get to attend the ASHA 2014 conference in Orlando, FL for one reason or another. 1st place- 10 TPT products–one from each of the participants in the hop! Each blog in the hop has a letter posted (some are blogs, and some are Facebook pages). Collect all those letters and type the code in the Rafflecopter box below to be entered to win! The contest runs for as long as the ASHA conference (give or take), so you don’t have long! If you need to start at the beginning, use the link below to head to Natalie Snyder’s blog, the first stop in the blog hop. I wish you all could meet the wonderful professor turned mentor turned friend who shared this piece of wisdom with me as an undergraduate. A seasoned SLP and busier than I even understand, I think these words meant more coming from her because she lived it every day. So often I think about how much I have to do, how I’m “drowning” in paperwork, and can’t fit a single child more onto my pushing 100-student caseload but then–I do. I always do. My head has yet to explode and I’m thankfully still breathing. So now that you have that little piece of advice, here is the last piece to the secret code! Remember, add it to all the other letters and enter that phrase exactly into the Rafflecopter box below. Be sure to use all the Rafflecopter entires here to win one of three great prizes! Good luck! As I prepare for my second year working in the school district, it’s crazy to think that I’m done with my CF(clinical fellowship) year. I met a new CF who is taking over my old caseload this week and was amazed in just talking with her how much I had learned and how far I had come in just one year. Maybe you’re like me, one or twenty years past your CF. Or maybe you’re starting your clinical fellowship, confident in what you’ve learned over the past 6 years, but still not really sure how to set off “on your own”. Well, some of my bloggy pals and I have decided to give you our tricks of the trade and words of wisdom that we wish we would have known when we were just starting off. It’s often so much better to ask questions before you tackle a tough eval or parent meeting before you jump in and make big mistakes. Everyone has been where you are at one time, so ask away. Then, write down the answer so you have the knowledge the next time you find yourself in the same spot. On that same note, take some risks! Want to change a therapy approach? Do it. Think a student could benefit from specific support in the classroom? Go talk to the teacher, or drop an e-mail. Often during my CF year, I found myself not speaking up when I felt like I should, or offering a piece of advice to a stuck co-worker at a SLP staff meeting. I would often think, “What do I know? I”m just a CF!” That’s just it! You’re a CF! You’ve just been through 6 years of intense schooling. If it’s the latest in research and technique, chances are you know it and know it well! While nothing can replace on the field experience that some of your more seasoned co-workers may have, but you have quite a bit of knowledge! While this may seem silly (as SLPs are typically a pretty friendly folk! ), it’s a good reminder. You’d be surprised at how far a genuine smile and “hello” may get you, especially working with new staff and teachers. Schedule yourself a lunch and eat with the teachers in the lounge. If you’re working in your room before or after school (you will be from time to time and it’s ok), prop your door open. Even if no one comes in, a closed door is less inviting than an open one. Attend staff meetings, breakfasts, etc. Teachers are much more likely to be on your team if they see you are trying to be on theirs. So there you go–a little pep talk from those of us who have been there. Now, go forth and make it the best CF year you can! I spent a few nights in a row prepping awesome posts and giveaways for my blog birthday week and I was so pumped when it was ready to go live. And then, I went on vacation. Without my computer. It turns out that my posts weren’t as complete as I had thought, and when I discovered this I had no way of fixing the problem from hours away. The long and short of it? I messed up. The good news is, however, that I am calling “RE-DO!” and opening up all the giveaways this week so you still have a chance to get your hands on some sweet free stuff. If you already entered, make sure you go back and check that all your entries are still good! So, check out this post, this post, this post, and this post. All giveaways will now end 8/5/14. You guys are awesome, and I’m never going on vacation without my laptop again. Now that you about this giveaway, and this giveaway, and this giveaway it’s time for some birthday freebies! If you watched my first tutorial video (yikes! ), you would have found out that my classroom theme for this upcoming school year is CHEVRON. I’m obsessed. As in my friends roll their eyes each time they see something even remotely close to the pattern when we are out together because they KNOW I’m at least going to spend time “Oooh” and “Ahhh”-ing over it. Anyway, my mission this school year is to brighten up my new, tiny office and what better way than with labels?! I’ve whipped up some of these cuties and thought I’d pass them on to you. 6 colored labels and 6 black & white labels are both pre-written and blank so you can laminate them and make them whatever you want them to be. That’s a total of 24! Each label is 3×5, or the size of a note card. Print as many copies as you’d like and make your speech room or office just that much more fun. Use this link to download them for free! Make sure you’ve entered all three of my fab birthday giveaways, and then tune in tomorrow for more great things! The past two days I told you about some stellar TPT packets from your favorite speech therapy bloggers that I’m giving away–be sure to enter to win those! Check out both Monday and Tuesday‘s giveaways. Today I’ve got a few app codes just burning a hole in my pocket from the great folks at Pufferfish Software. In keeping with the spirit of 2, I have 2 codes for 2 of their great apps for our students with Autism and Autism Spectrum diagnosis. Social Stories is an ABA app designed to help special needs children and young adults understand social situations and give them tools to respond correctly to their environment, in their environment. Social Stories is designed to be easy to use and easy to understand. Social Stories is an app for teaching children or young adults with learning challenges or special needs. A photo is paired with a line of text & audio to show the child, to help visualize what they need to do or understand on each page. To create one of these stories, tap the add button in the upper right hand corner and create a new story. Stories can be one or multiple pages. 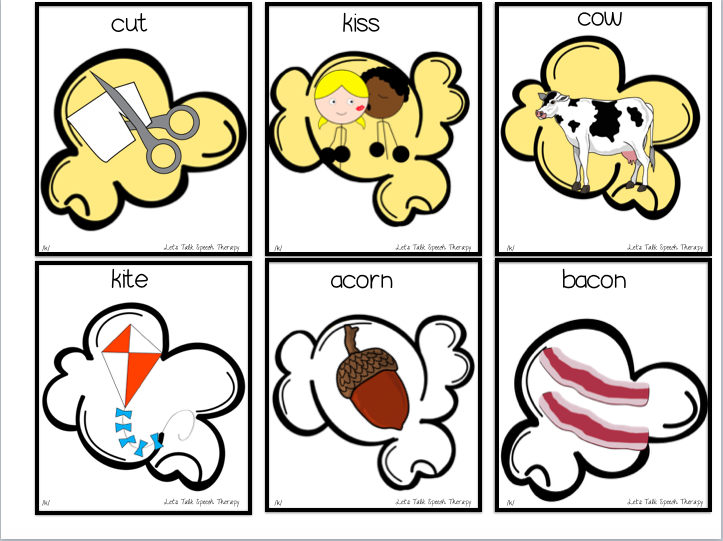 The picture and text is designed to give each child a visual representation of good behavior, for kids who find it easier to communicate through visuals then through speech. Visual Routine is a simple, easy to program visual schedule that helps your autistic or special needs child keep a routine. Routines can be tailored to their needs with audio feedback, and customizable pictures, audio, and text. Instead of carrying around pecs or a laminated schedule, this app will let you have routines preset and then run them to show the child in an easy way what they have to do. •Create text only, picture only, or audio only choices, or any mix. This app serves as a visualization tool for routines, providing portability, audio support, and excellent easy to understand graphics. By using this app special needs individuals and children will be able to understand what needs to be done easier then with PECS or simple description. Customization: A big emphasis in this app; every autistic and special needs child requires specific and centered care, and the ability to create your own routines with pictures of your child and house settings in them places the emphasis on your child. Take pictures of them doing things in their environment, and they will understand the routine better then a generic, preset choice. The images can be set by you, the user, as well as audio. 4 winners will be selected and sent an app code at random. (I’m sorry, but winners will not be able to select the app of their choice). Use the widget below to enter. As with all other giveaways this week, you only have until 8/5/14 to enter! I seriously love parties, not to mention one that lasts an entire week! Yesterday I told you that I’m celebrating my 2 year blog birthday, except YOU are getting all the presents! I also started a giveaway for some awesome TPT materials from my fellow speech bloggin’ pals. If you missed that post, check it out here. Today’s giveaway is another TPT bundle that I know you’ll love. It’s full of both summer-themed packets (Little Old Lady, anyone?!) and a few handy resources for back-to-school. Use the rafflecopter widget below to enter. Don’t forget that all giveaways this week end on July 21st, so don’t wait too long! Good luck! Bust out your candles, party hats and noise makers because it’s party time! Let’s Talk Speech Therapy is turning 2 this week! Two years ago I was enduring a summer of intense grad school classes, and as a creative release I started my tiny corner of the internet. Little did I know where it would lead! The past 2 years have been full of exciting events, not to mention connecting with so many great speechies along the way. Every TPT purchase, feeback, and blog comment makes me a better SLP, writer, and professional. So while I am excited for this milestone, you are the ones who should be celebrated! 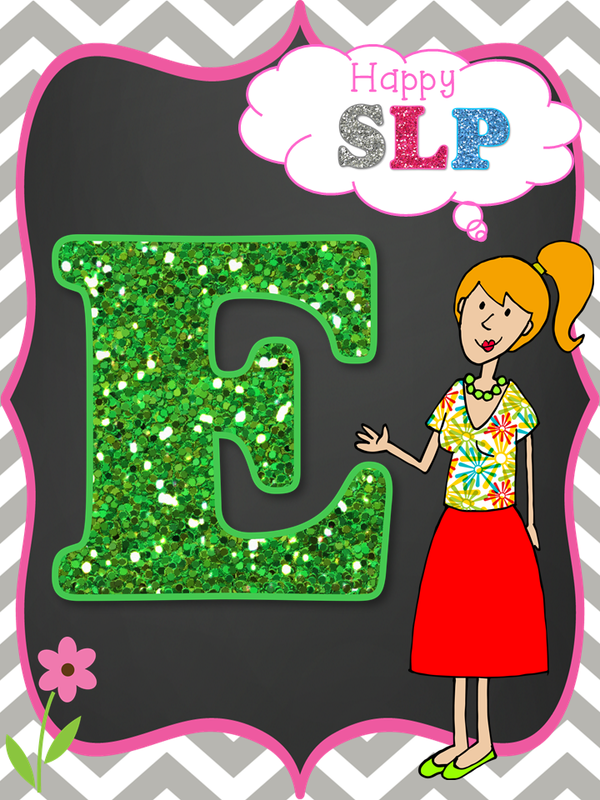 This week I”m hosting three different giveaways: 2 for awesome TPT materials from some of the best SLP bloggers around, and one loaded with app codes from Pufferfish! Each giveaway will start a different day, but they all will end August 5, so make sure you keep coming back! Also, be sure to be around my Facebook page for some freebies and giveaways! Here’s the widget for the first giveaway. Good luck! Holy smokes. How is it July?! There is a color and black & white version available. Same content, simply less color! Want to know more? Check out this video (and please don’t keep data on how many times I say “um”). Click here to grab this from my TPT store in color and here in black & white. Or you can enter the Rafflecopter below to win your own copy with a PERSONALIZED front. That’s right–you win, drop me an e-mail with the name/information you want on the cover, and I send it off to you! Pretty sweet, right? Right. Enter soon, you only have a few days, and be sure to tell all the SLPs you know! Good luck! Woot woot! As many of you know, the month of May is “Better Hearing and Speech” month and some of your fav bloggers and I have gotten around a little gift for you! We’ve collected tidbits and goodies of information about this wonderful profession we are proud to claim and are giving away some TPT money to help make your days a little easier. Now for my tidbit! If there are two things I l.o.v.e. about my crazy-awesome job, it’s Early Intervention and Language skills. Did you know that little guys (and gals!) don’t really use “Mama” and “Dada” with attached content until around 11 months of age? It can happen anywhere between 9 and 13.5 months of age, but 11 months is the standard (1980, Reilly, Johnson & Johnson). Another big milestone is imitation. It’s always super cute when you can start playing copycat with a tiny little voice. Babies start imitating gestures before words and sounds. So how does that effect treatment? Start with gestures! Try to get gross motor imitation before you expect little nuggets to imitate/produce approximations of sounds and words. I feel like this is something I always have to remind myself of because often times I get caught up in trying to talk, talk, talk for data purposes. This is also really handy to keep in mind while writing goals/objectives for our little nuggets. Use the “First Blog” button to head all the way back to Crazy Speech World’s post, and use the ” Next Blog” button to head to Live, Love, Speech’s post. Best of luck and happy hopping!